Monday 28 September 2015 Full Moon in Aries – Sun in Libra Harvest Moon 03:52 BST London Element – Fire/Air * SUPER FULL MOON TOTAL LUNAR ECLIPSE East Pacific, Americas, Europe, Africa, West Asia Book HERE http://fullmoonaries2015.eventbrite.co.uk This is the closest Moon to Earth this year. Put these dates in your diary and come to the gathering. If you want to Skype through let me know. What are you celebrating this Super Full Moon? A wedding? A promotion? A victory? A completions of a project? Taking action you thought you could not do? Telling yourself a new story? Congratulations. This Super Full Moon illuminates what wonderful things we have. It highlights our joy and commitment to be happy. It shows you want you want and what you need to do. You take action and you win. I nternal & External Conflicts Watch both your internal and external conflicts. If your emotion is not balanced you could argue and shout with your partner or people around you. If the emotion is not secure you could cause a blockage in your energy frequency and in your relationship. If your emotion is not settled you could break up with your partner. If the emotion is not safe and grounded you could cause an uproar in your environment. Emotions Connect to your emotions you have been feeling in the past 7 days before the Super Full Moon and notice the emotions you are feeling 7 days after the Super Full Moon. Accept them. Accept the challenges of the emotions. Accept the victories of the emotions. You have come to the Full Moon to celebrate your victories you have brought with the Full Moon. What victories have your brought in? Triple Triple Triple Super Moon For me, this Super Moon is a Triple Triple Triple Super Moon. It has a strong resonance. We have had lots of New Moons and Full Moons this year, with many downloads like the 888 just gone. We will have much cleansing, clearing, purging, releasing and freeing. After the releasing we will have much liberation and freedom and a deep sense of peace and inner knowing and inner peace and inner radiance. Thanking all the Legions of Light who attend the Moon Gatherings and create the sacred crystal grid matrix to send healing to the world is a very appropriate thing to do at this point. I would like to thank the Legions of Light who have been involved with the preparation of the sacred space, the offerings, and the inspiration of the energy. You know who you are. You have asked me to keep this private and confidential and I am. C reating this sacred grid is a very serious job. You would not want your surgeon to be inattentive when operating on you or your loved ones. So when we are creating a sacred crystal grid, we are in healing mode working with our feelings, our intuition, our imagination and our discussions; as we collectively create a vortex of healing for the world. Death Full Moon in Pisces is about death. Pisces is the last zodiac sign and a time to let go and let God. It is a time of internal conflicts – the fish swim in opposite directions – while the energy of Virgo is pure and puritanical – wanting order and rigidity. To allow flow you need to let go any solid weight or anything blocking your energy. What do you need to let go of? Like a hot plate you need to drop so it does not burn you. What needs to die in you? What has to die in your? Who has died around you? Who is dying around you? What are you doing with all this ‘death’ around you? Your negative emotions and limiting decisions need to die. Pisces is takes us to the underworld – to the uncomfortable parts of ourselves. This is an emotional vortex of pain and suffering. The cleansing and releasing will be freeing and liberating for you. Call In Call in the fullness of yourself. Call in the Full Moon of yourself. Call in the fullness of the Full Moon in you. 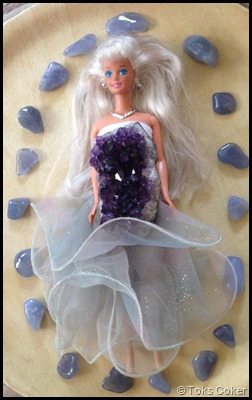 Sense and greet the ten crystals you have around you made up of Blue Lace Agate, Chalcedony and Serpentine. Ground your energy and take deep strong breathes of life. Glittering Foundation (Virgo) Call forth the glitter in your life, on your skin, on your face, and in your energy. Welcome the Spiritual Glitter of Life around you and all over your body. You are a fabulous portal of Healing Glittering Radiating Light. Welcome that energy in and bloom forth from deep within. Let the glitter on your body represent Glittering Foundation (Virgo) and Glittering Light. A foundation that is solid, secure and stable. A foundation that is rooted and strong. A foundation that is practical and seen. Feel the greatness of that energy. Feel the grounding in your body. The more grounded you are the more spiritual. Healing the ‘I’ in ‘Me’ and ‘We’ This Super Full Moon is about healing the ‘I’ in ‘Me’ and in ‘We’. The ‘I’ in ‘Me’ is the relationship with yourself. The ‘I’ in ‘We’ is the relationship you have with others. My newsletter I sent out talks about this in detail. If you have not joined my Newsletter now is a good time to do so. Every two weeks I send out invaluable information on a valid topic of self-help, self-empowerment and self-love for success in all areas of your life. Here is the link to join: http://handsoflight.us6.list-manage2.com/subscribe?u=cef53a93193163f7880dbc002&id=3d11bf38cf During the invocation workshop for this Super Full Moon I will channel a great healing exercise to help you to connect and cleans your ‘I’ in ‘Me’ and ‘We’. I will be sending the recording to those who attended the workshop. Allowing Yourself Healing It is so important to allow yourself to receive the blessings of the Energy of Now, especially in the next 3 days. Allow yourself to receive healing and receive special offers, career opportunities, gifts of money, and other possibilities that come to you. Grab them as they are gifts and blessings from the Divine. Concentrate on receiving the healing you need in your life. Really receive healing. Call Forth all your possibilities. Call forth everything you have achieved to date. Call forth all your completions. Remember them now. Call forth the joy of the completions. Call forth your victory. Call forth your omens, signs, symbols, signals and messages. Call forth your magnificence. Call forth your inner knowing of who you are. You cannot know who you are if you do not look at who you are and you you have become and who you are becoming.